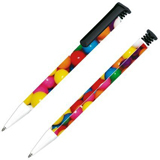 Super Hit ball pens are one of the most cost effective and popular budget promotional pens. The Super Hit ball pens can accommodate all types of company logos whether it be simple spot colour branding or full colour process branding know as Extreme branding. 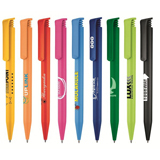 Promotional Super Hit pens can also be supplied in your chosen colours using the mix and match system. Solid, frosted or metallic finished also available on our range of promotional Super Hit pens. Lancewich supplies promotional pens manufactured throughout the world but the popular Super Hit pens are manufactured in Germany a very popular selling point to consumers. The Super Hit pen can not only be branded on the barrel like most classic promotional pens but actually on the clip also ensuring maximum advertising impact. Another key selling point about the promotional Super Hit pen is the large barrel print area. 50mm x 25mm. Promotional pens are a very popular cost effective giveaway at trade shows and events. 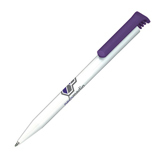 Give your clients a promotional pen and you can ensure that your name and message will be in the mind of the recipient. Lancewich supplies a large range of promotional items including bags, clothing, stationery, clocks, cosmetics, inflatables, paper products, mugs, folders, usb memory sticks and confectionery to name a few.